has always been proud of the partners we work with. And we’re always excited when a new partner comes on board! This year, we were fortunate enough to welcome the Tucson Convention Center (TCC) into the Jani-King family. The convention center is home to the brand new American Hockey League (AHL) team, the Tucson Roadrunners! The Roadrunners were acquired by the Arizona Coyotes in May, making them the first AHL team in Arizona. The Roadrunners will start their Pacific Division 2016-17 season this October. In May, fans were able to enter the “Name the Team” contest to select the new franchise’s team name. 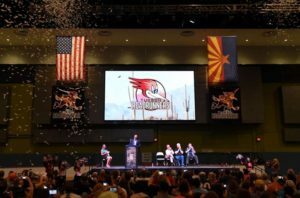 This June, the name was selected: the Tucson Roadrunners! Jani-King is thrilled to work with the Phoenix Coyotes as their official cleaning partner, and Jani-King Tucson has enjoyed working with the TCC arena for more than a year. Participating in and supporting our community is an integral part of Jani-King, and we look forward to our continued partnership.